Welcome to the Law Offices of Eric T. Dean, Jr. Welcome! Are you looking to bring your fiancée or wife into the United States? Let us help you obtain the K-1 fiancée or CR-1 marriage visa & Green Card you need. My law office offers QUALITY and PERSONAL SERVICE from a Husband (Eric Dean, Attorney) and Wife (Elizabeth Dean, Legal Assistant), who met online and were themselves married on a K-1 Fiancée Visa. We understand the anxiety and uncertainty you must be feeling right now. Let us use our personal experience to reassure you and guide you through the system. Legal experience and ability from a licensed attorney who knows what he is doing. Commitment: we are dedicated to our work. (1) Experience and ability: You want someone on your side who knows what he is doing. 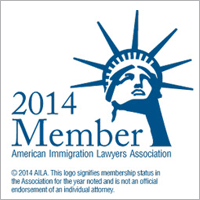 I am a lawyer with 25 years’ experience, and I am a member of AILA (American Immigration Lawyers Association). Immigration law is complex, and you need an attorney who understands the law. You need someone to deal with any curve balls which may come your way. (2) You will deal directly with me: if you hire us, my wife and I will personally work on your petition and case. If you call, I will be the one to answer the phone. *when other laws firms say you can call them 24/7, what they mean is that they have an answering service. We don’t have an answering service; we answer our own calls. (4) We don’t have gimmicks; we are “straight-shooters”, and we are not going to make wild or empty claims to try to convince you to hire us. The “quick & easy visa” places will flash numbers at you such as $175 or $200, but when you check into it, you will discover that if you actually hire them to handle your case, you end up doing your own forms; or they have small print which admits they are not attorneys and cannot give you legal advice. If you run into trouble after you have hired the “quick & easy visa” places, you will be on your own. (5) I am licensed to represent clients from all 50 states and from any country overseas in fiancée and marriage visa petitions. (7) Watch out for so-called “immigration consultants”: There are on-line businesses which handle fiancée & marriage visas, which are run by non-attorneys, who claim to be “certified immigration consultants”. An “immigration consultant” is not allowed to practice law (and they will admit that in the small print at the bottom of their website). If you have questions which require that they tell you what the law is, or give you legal advice, or if you need representation before the USCIS, an immigration consultant cannot help you with any of that. So what are you getting into by having such an outfit handle your fiancée or marriage visa? Why would you want to hire someone to handle your fiancée or marriage visa if that person cannot even give you legal advice or represent you in front of the USCIS? All these people do is fill out your forms, and, in fact, their websites are often set up so that you fill out your own forms! And pay them for that? If you hire us, we will be there for you from start to finish. (1) We do all the work for you: we will prepare your petition, including all forms and necessary supporting documents and affidavits. (3) We will assist your fiancée or wife in preparing the necessary forms for her consular processing and interview. We will give her sample questions and instructions on how to prepare for her interview. (4) No hidden costs: we charge a flat fee which covers whatever time is necessary to get your fiancée’s visa. When all is said and done, if you hire us, you will be relieved and satisfied to have an attorney on your side. We feel that we offer the best value out there. We take the anxiety and fear out of this process, and we are here at all hours & on weekends, to answer your questions or concerns. You will feel relaxed picking up your phone to call us. I believe this is the law office you have been looking for! Please contact us and allow us to help you obtain your K-1 fiancée or CR-1 marriage visa.